Registration is now open for the 34th Annual Madison Triathlon, sponsored by Zane's Cycles and renamed for friend and Event Director Dave Parcells! Individuals, teams, first-timers and paratriathletes are all encouraged to participate. Early-bird pricing offered until August 8=7th, 2019. Only 500 spots available, reserve yours today! (No refunds permitted). Friday September 6, 2019: Packet pick-up offered at Zane's Cycles in Branford from 12pm to 6pm. 7:00 am: First wave starts (we anticipate 5 waves, each 5 minutes apart). All proceeds from the race benefit various Shoreline non-profit organizations. A fundraising raffle will also be offered, tickets are available for purchase online at the time of registration and also at the event. Prizes will be awarded to the top 3 finishers in each age group. The first male and first female overall will each receive $200 in prize money, $150 will be awarded to the second place overall finishers, and $100 for the two finishers in third place overall. INDIVIDUAL RACE DIVISIONS AND AWARDS:Ages 19 and under, 20-24, 25-29, 30-34, 35-39, 40-44, 45-49, 50-54, 55-59, 60-64, 65-69, 70-74, 75+. Both male and female awards will be given to the top 3 in each age group, Plus Clydesdale categories for males 200+ lbs., and females 150+ lbs.TEAM COMPETITION AND AWARDS:All Male, All Female and Mixed Teams – Awards to each member of the top finishing team in each division. The first 14 years of the race was known as the Madison Relays with four legs,swimming, running, biking and canoeing. In 1999, the race wasreformatted into a triathlon and triathlon relay. This new format resulted in a significant increase in the number of participants and allowed the Jaycees to increase their support for local charities and youth sports programs. For course maps please visit www.madisonjc.com. The race course winds along the beautiful Madison Shoreline. The swim will be a diamond shaped course. Swimmers will head out towards their left until the first orange buoy. Keep the buoy on your right and take a right hand turn and head out towards the farthest buoy from shore. After approaching this second buoy,swimmers will also keep this buoy on your right and head on an angle back towards the shore to the third buoy. Swimmers will keep this buoy on their right and turn right back towards shore where the race started. There will be a buoy close to shore to act as a guide to help the swimmers spot the finish. You may swim on either side of this buoy. Any swimmer having trouble should follow the standardpractice of raising their hand so assistance can be provided bythe marine patrol. Please make sure that all swimmers have their arms marked withthe proper race #. 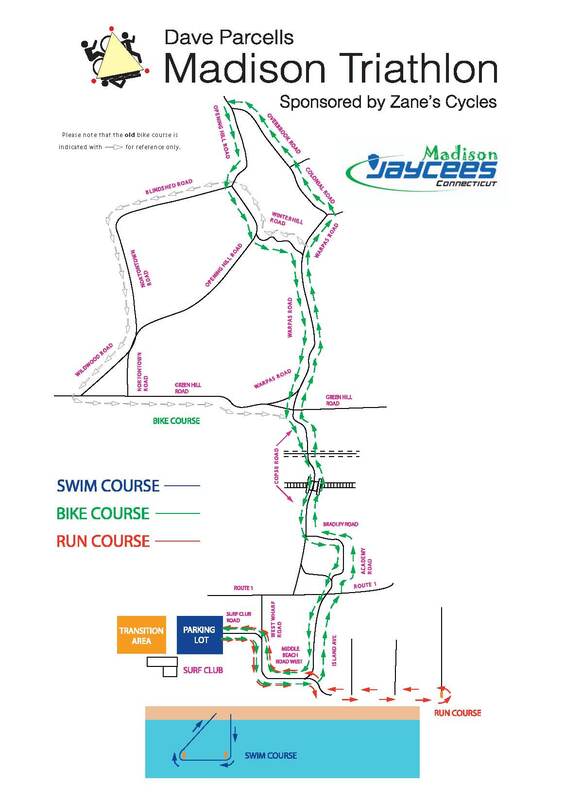 The bike course map maybe found on the Madison Jaycees web site. The course is flat and rolling with no majorclimbs. The course will be a little congested with traffic thefirst and last couple of miles because of Rte 1, skirting thecenter of town and quite a few turns. Once you get over the RRbridge on Copse Rd, there are several good long stretches. The course will be marked with chalk. However, if it rains, thechalk may wash off. Our intention is to have at least 1 volunteerat each intersection to help with traffic control and directions.HOWEVER, IT IS YOUR RESPONSIBILITY TO KNOW THE COURSE AND HAVE STUDIED THE MAP AHEAD OF TIME. Drafting is not permitted and you need to stay 2 bike lengthsaway from other competitors unless you are in the process ofpassing. Course marshals will have authority to disqualify orpenalize participants if they are observed drafting. There are acouple of areas that will require extra caution on your part. At the 2 mile and 11 mile marks you will be crossing Rte 1 at theintersection of Island Ave. A police officer will be on duty atthis intersection as well as several volunteers. Please exercisecommon sense and caution at this crucial intersection. At approx 4.5 miles you will be traveling up Copse Rd andcrossing over Green Hill Rd. Green Hill is a very busy street andcars often travel at excessive speeds down the hill when theycross over Copse. Several volunteers and possibly a policeofficer will be located at this intersection but please be awareof cars coming down from your right as you pass over Green Hill. The run course is perfectly flat and fast. It is an out and backcourse along the shore roads. As you approach East Wharf Beach,you will be directed into the parking lot where you will runaround a garden in the parking lot and head back to the SurfClub. Please be aware that approximately two miles of the run areshared by both the bike and run courses. The transition area is for athletes only. Once the race begins,all spectators will not be allowed in the transition area. RIDING YOUR BIKE IN THE TRANSITION AREA IS NOT PERMITTED. You will be required to walk or run your bike while in the grass transition area. Once you are outside the area, you will be allowed to mount your bike. You must also dismount your bike before entering the transition area. Upon exiting the swim, the swimmer must run up the beach into the transition area and transfer the Velcro ankle bracelet (containing the ChampionChip) to the cyclist in the designated team area. The cyclist must wear this bracelet on his/her ankle.Only after the swimmer transfers the ankle Bracelet, may the cyclist take hisbike off the bike rack and proceed to run or walk his/her bike tothe transitions area exit. All relay teams will be located in acertain area so marhsalls may observe the proper tag. Uponreturning to the transition area, the cyclist must dismount thebike and run or walk the bike back to the team area. Afte rracking the bike, the cyclist will transfer the ankle bracelet to the runner. Do not transfer the bracelet to the runner before racking your bike. The runner must also wear the bracelet on the ankle in order to be properly timed. Failure to wear the bracelet on your ankle may result in your team not being timed and you will be disqualified. NOTE ON CHAMPIONCHIP TIMING DEVICE. Each indidual and team must return the ankle bracelet containing the ChampionChip device immediately upon finishing the race, Failure to return the device will result in a charge of $30 to the individual or team. HAVE A GREAT RACE AND ENJOY THE BEAUTIFUL TOWN OF MADISON.